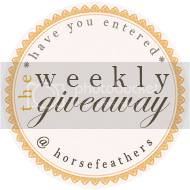 Olivia Collins is having a super cool giveaway at her blog Horsefeathers. I usually don't blog about a blog giveaway unless it is one that sets my heart aflutter, and this one definitely does! If you haven't checked out Leigh's (Horsefeather's Giveaway Sponsor) Etsy shoppe Barberry & Lace before I suggest you do so immediately. Seriously I am in love with EVERY PIECE in this young woman's shoppe. Oh, how I wish I had more money in my name to splurge on the beauties in the B&L shoppe....or that I could win the lottery like right now (I know you said something similar to this Olivia and I feel the same way)!! So, please head on over to Olivia's blog, and also go and check out the lovely Etsy shoppe of Leigh Ashley!